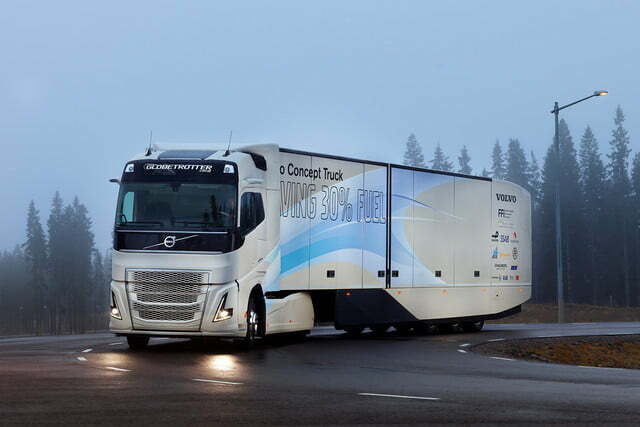 Volvo Trucks — a company completely independent of Volvo Cars — has introduced an experimental heavy-duty truck powered by a hybrid drivetrain. The prototype showcases realistic, close-to-production ways to begin weening the long-haul transport industry off of fossil fuels. Called simply Concept Truck, the model is an update of a prototype originally introduced in May of last year. The most important modifications are found under the skin, where the truck is equipped with a diesel-electric hybrid drivetrain. Full technical specifications haven’t been published yet, but we know the concept’s main sources of power are a 12.8-liter, six-cylinder turbodiesel engine — called D13 in Volvo-speak — and a powerful electric motor. The electric motor takes over for the oil-burning six up to 30 percent of the time, which improves fuel economy by up to 10 percent depending on the type of road the truck is traveling on and what it’s hauling. A brake energy recuperation system similar to the one used in hybrid cars tops up the batteries when the truck is driving down a hill or braking. A hybrid-specific navigation system analyzes topographical data to figure out the most efficient way to use the two power sources, and the best time to deploy the juice stored in the battery packs. The tech helps the Concept Truck drive on electricity alone for a little over six miles; that’s not much compared to today’s plug-in passenger cars, but every little bit helps in an industry where single-digit fuel economy figures are still common. 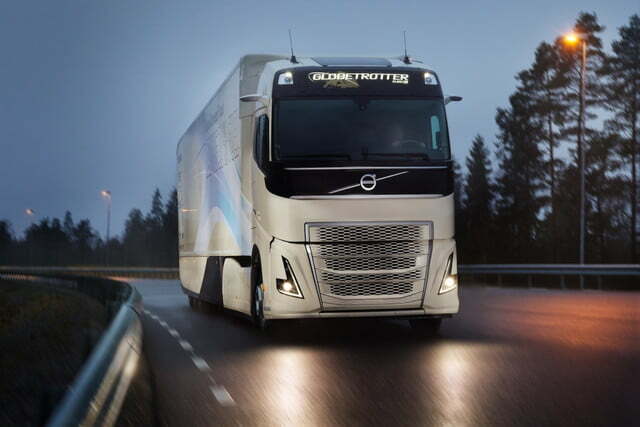 The Concept Truck is based on the FH, one of Volvo Trucks’ regular-production models. 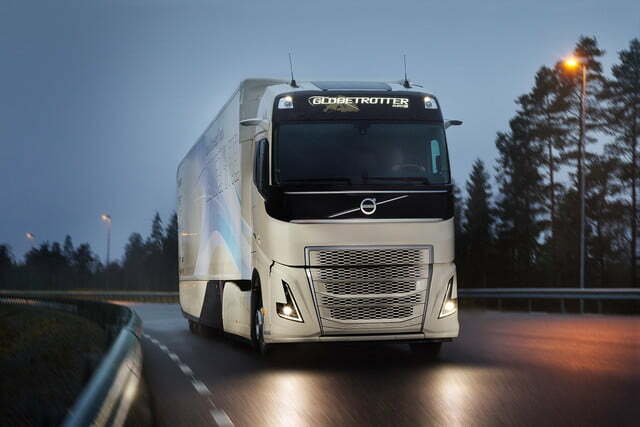 Engineers have made the prototype more aerodynamic by replacing the side mirrors with cameras, covering up the rear wheels to reduce air resistance, and adding spoilers to the back of the trailer. They’ve also maximized air flow to the engine compartment, and reduced the truck’s weight. 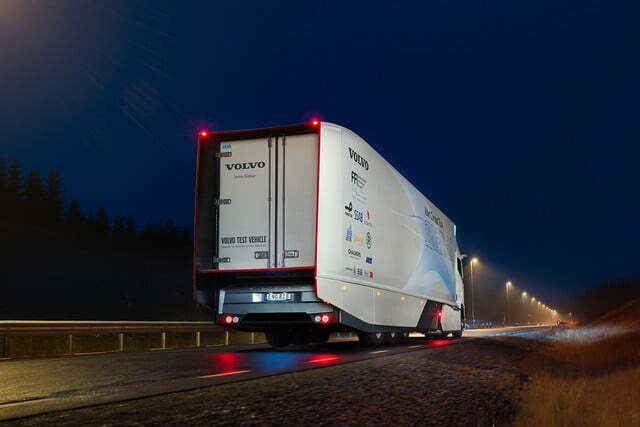 Volvo stresses the Concept Truck is just that: a concept truck. However, the company promises some of the tech features — like the diesel-electric drivetrain — will make the transition from prototype to production in the near future.